90-Day Map to Marketing Success. Shut out all the Facebook this, the Tweet that… take a breath. Relax. None. Of. That. Matters……… yet. What folks say about working with Drew and the Hudge Factor framework. 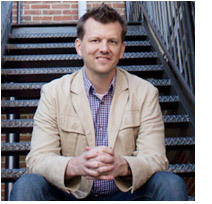 Working with Drew gave us a whole new, fresh perspective to which we were simply blind before. With his insights, we took our [insurance] website from virtually zero online leads to a 6330% lift within the first year of our revamped site going live. Hire Hudge if you’re looking for someone who is ethical, on the cutting edge of marketing and you want to get positive results. With Drew’s guidance and all the things we’ve implemented—with both our online presence and off line promotional materials—our business has tripled in revenue the last three years! The real deal! [Drew] possesses business acumen well beyond his years. When it comes to marketing strategies and implementation (online and offline), he’s both savvy and creative, a rare combination indeed. Anyone seeking to grow a business would do well to utilize this man’s expertise. Regardless of where you’re at right now, Drew can take you and your business to the next level. or a Gajillion Facebook Likes? It’s just that you’ve been flooded for years with “website this” and “social media that”, that you absolutely can’t escape the thinking! You think you do. But you don’t. …to actually be around for your kids? and maybe even make some great memories with some travel? And you also believe you need to spend more time, more money, hire more staff to get to all those things you really want. You’re in the right place. But you’re going to have to drop that “What I really need is [insert this week’s social media buzz word]” mindset if you keep reading. Well, I used to make websites. I hate making sites. I used to get people to the top of Google too. Know what though? I hate promising results based on something over which I really have no control (e.g Google’s “change-at-least-once-a-day” algorithm). It’s time someone brought you some real answers. Drew gives great attention to detail and to the customer and their desires and gives honest insight of what really would work best. He brings a different approach and the results will speak for themselves. I have been shown ways to build email lists and have potential clients provide invaluable feedback. Intentional about giving you guidance with a personalized approach. He spent quality time with me to learn more about my book’s purpose and message in order to help me discover a book title that would bring real results. Organizations are now contacting me, interested in basing their curriculum on my book! Drew asks the right questions and keeps us on track to pursue the right data. [He’s made us] think beyond our day-to-day, and helped us establish a plan for success—his insights and his sense of urgency make us feel energized. Exec. Dir, Pennyroyal Hospice, Inc. I made things like videos and designed brochures… eventually websites. I got all pious and snooty; I thought that good-looking stuff was the reason behind a business’s success (or failure). But at some point, I couldn’t take it; I knew my paradigm was all wrong (of course, there was much more to a business’s success or failure than their doggone flyers or website)… but I was ignorant and didn’t know what to put my finger on. Determined to hyper-widen the view I had at the time from the narrow lens through which I had been viewing the world—and my clients’ and my own businesses, I made it a point to reach out to successful people who obviously had a process they had built or adopted, for their success. And I asked them questions and learned about how they built and managed their businesses. • Invested in coaching… Got clear. Got challenged. And got moving! And finally, created this 5-Phase, step-by-step deep-dive method of getting measurable results. It’s called the Hudge Factor Framework. With this framework, I now get to help business leaders, entrepreneurs and SMBs get clarity and focus in an information-over-saturated world, and move toward an automated flow of leads to grow their client base, generate more revenue and feel some of that freedom they always knew was somewhere in the equation. • A clever tag isn’t going to tip someone who’s on the fence into becoming your client. • A website, even a new one, doesn’t guarantee so much as five people are using it. There are plug-and-play formulas for reaching particular milestones. Repeatable and scalable actions—and they aren’t nearly as complicated as you might think. • to turn on traffic whenever you want? Sure. • to tweak your website so it boosts both office morale and your conversions? Yes! • and to rekindle that connection between you and those long-forgotten clients? That too! And don’t get me wrong: sure, you still need to look great. 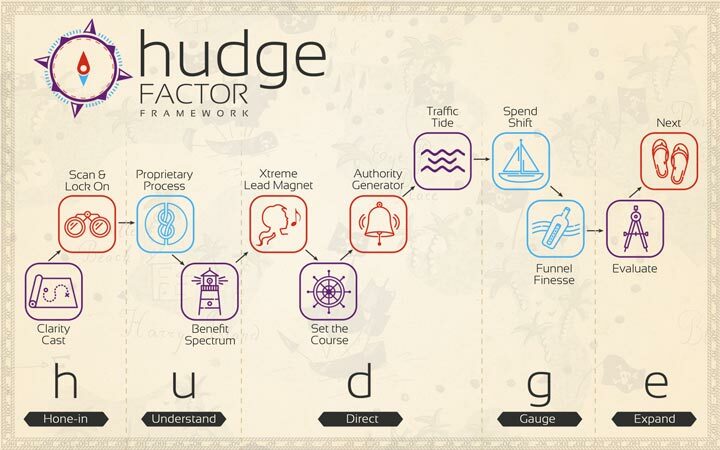 … the Hudge Factor Framework is your compass and map to steer you through the storm of information and myths, right to that “Flow-of-Leads Island” you’ve always known was out there somewhere.